Rebecca Basulto waves a Cuban flag and an American flag in the Miami neighborhood of Little Havana in 2008. Cherie Cancio Franqui, 31, voted early in the Florida midterm elections. In the 2016 primary elections she had gotten to the polls 30 minutes before they closed so she wanted to make sure she had enough time this year. Like many of her other Cuban-American friends she supported Andrew Gillum for governor and thought, if the millennial turnout was high, he could win. "I think as millennials we are leaning more center-left," Cancio Franqui told NBC. "We are focused on climate change, minimum wage, equality, social issues. So we are more aligned with mainstream millennials than the rest of the community. Cuba is not at the front of our minds, we want to have more open dialogue with the island." Although younger Cuban Americans are starting to lean toward the Democratic Party, the number of votes have still not been high enough for Democratic candidates to win. Cancio Franqui, a first generation American of Cuban and Puerto Rican descent, is co-founder of the CubaOne Foundation, which offers young Cuban-Americans the chance to build relationships with the island. Many older Cuban-Americans aren't in favor of maintaining such links, she said, but added that she was not speaking on behalf of the foundation. "The voting patterns of young Cuban Americans are largely consistent with those of their non-Cuban peers because they are culturally similar to millennial Americans who live in large urban areas and vote Democrat," said Giancarlo Sopo, a 35-year-old U.S-born communications strategist who is also of Cuban heritage. Cuban voters make up roughly 6 percent of the total Florida vote, he said. According to an analysis Sopo performed of election results in heavily Cuban neighborhoods, he estimated that in 2016, the Cuban vote broke 57 percent for Trump and 40 percent for Clinton. Two years later, it went 66 for Ron DeSantis and 33 for Andrew Gillum, that is 2 to 1. To illustrate the importance of the Cuban vote, Sopo created a model simulating what would have happened if the numbers had broken down in the same way this year as in the 2016 elections. "Had DeSantis mirrored President Trump's performance and beaten Andrew Gillum by a 17-point margin, we'd likely be looking at a Governor-elect Gillum now," he said. However, the share of Cubans who are Republican has reduced over time. In 2002, 68 percent of Cubans 50 and older identified as Republican. Sopo argues that the rightward shift this year is the result of electoral demographics. 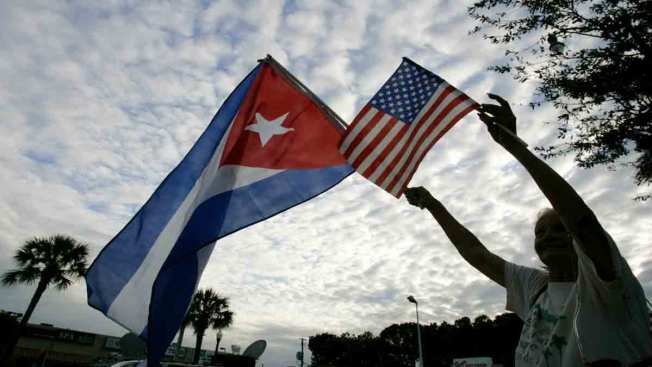 "What seems to be happening is that the Cuban American Democrat voting bloc largely consists of younger voters who are also among the least likely to vote in midterm elections," Sopo said. The pre-Election Day data show that 18- to 29-year-olds represent 6 percent of the ballots cast in early voting despite being 17 percent of the electorate. Sopo said fewer Cuban-Americans participate in midterm elections and the Cubans who do vote tend to be older, resulting in the Cuban vote performing more Republican. One factor that may have led to smaller turnout among young Cuban voters was that Republicans very effectively labeled Gillum as a socialist, Sopo said. Among the younger Cuban-Americans that voted was Ivan Flores, a 30-year-old journalism student who flew home to Miami the weekend before the elections. After over a year living in New York, he had kept his registration in Florida because he knew his vote would make a difference there. “I wasn’t motivated by either candidate to vote for them, but I was happy to vote for an amendment on voter re-enfranchisement, an end to greyhound racing and a ban on offshore drilling,” he said. Flores has different political inclinations than his Cuban family, which has a history of voting Republican. “The Democratic Party was seen by many as the party of traitors,” said Jorge Duany, director of the Cuban Research Institute at Florida International University. Older Cubans have held a grudge against Democrats for the failed Bay of Pigs invasion that aimed to topple then dictator Fidel Castro, he said. "There is a disparity between the people who came in the ‘60s and ‘70s and the younger people who are open to be in contact with the island,” he added. The FIU 2016 Cuban poll shows that 43 percent of Cubans ages 18 to 39 supported Hillary Clinton, while among the 76 and older age group she only had 22 percent. Despite this apparent shift among young voters, there are still Cuban Americans who more closely identify with Republicans. “The Democrats are going more and more to the left and this could disrupt the economy,” said Armando Ibarra, president of the Miami-Dade Young Republicans. Ibarra’s mother came to Miami in the mid 1960s while his father could not escape until 1979 because he was in a concentration camp, an event that deeply scarred his family. “Republicans on the other hand are taking action against the dictatorship in Venezuela, and they look after our interest," he said. Ibarra said that perhaps younger Cubans are not as Republican as their parents, but noted Republican candidates still win. "This sort of narrative has been going on for the past years," he says, "but Cuban Americans keep voting for Republican candidates. Cuban-American areas in Florida are strong supporters of Republican candidates and this cannot only be old Cubans. I think the only measure that matters is the elections."